Ernie Scherer III, long considered a person of interest in the murder of his parents, was formally booked on murder charges earlier this week. Scherer III called himself a professional poker player, and managed to amass around $340k in total lifetime tournament winnings during the course of his career. 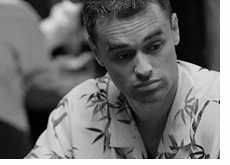 His biggest cash came in 2005, when he managed to finish in 7th place in the Festa Al Lago IV "Doyle Brunson" North American Poker Championship. Investigators in the case contend that money was the prime motivator for the two brutal murders. Ernie Scherer, Jr. and Charlene Abendroth were murdered in their home and discovered a week later by their daughter. Scherer III and his wife, according to investigators, were falling behind on their property tax and mortgage payments. They were already $40,000 in debt, and were recently declined for a loan. Scherer III was apparently of the opinion that he would be entitled to $1.5 million dollars in inheritance money if his parents met their demise. Scherer III apparently drove from Las Vegas to his parents' Castlewood Country Club home, murdered them in cold blood, and then drove back to his home. There was mounting evidence that pointed to Scherer III as the perpetrator of the murders, as well as increasingly erratic behavior from the suspect himself. Those close to him say that Scherer III was extremely paranoid about the fact that he was being considered a suspect in the murders. Scherer III was apparently a compulsive gambler, and certain members of his family felt that it would be a mistake to give him any inheritance money. According to multiple published reports, Scherer III was originally supposed to receive his inheritance money when he turned 30, but the arrangement was later changed at the behest of his father. Scherer III apparently acted alone in these murders - there is absolutely no indication that his wife had any knowledge whatsoever of her husband's plans. We'll keep an eye on this story as it develops, but the case against Scherer III seems pretty solid and there is no indication at this time that police are looking at other potential suspects.